Spinner luggage is an upright suitcase with four luggage wheels for easy movement in any direction. The wheels are located on each of the four corners of the luggage. Spinners are relatively new addition to the modern luggage range. The biggest benefit of the spinner is how easy and effortless it is to move it in any direction, reducing the strain on your arms and back. 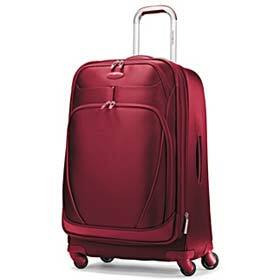 The luggage wheels are what makes suitcase as spinner instead of traditional roller case. The spinner wheels allow you to move the spinner easily in any direction with little resistance. This is what makes spinners such a popular luggage choice... you can push, pull or turn in any direction (360 degree rotation) with effortless mobility, reducing the efforts and strain on your arms. Empty spinner bag tends to weigh a bit more than other bags due to the sturdy luggage wheels system. This Top Travel Tips article, Quality Of Luggage Wheels, explains how you can check your luggage has good wheels. You can choose between wide range of material as spinners are made of polyester, ballistic nylon, leather, polycarbonate, polypropylene, aluminum, etc. Each material has its own characteristics, i.e. the leather is more durable but heavy while nylon is lighter and some material is easier to maintain and clean than others. It can be matter of preference which material to choose. Most travelers though prefer their luggage pieces to be as lightweight as possible, due to the limited baggage allowance and the airlines strict carryon luggage weight limits. If you prefer soft material spinner luggage set then ballistic nylon or polyester tends to be the most popular choices. Ballistic nylon is very durable and easy to clean while polyester is often used in smaller and less-expensive items. When buying luggage made of nylon material you should check the denier rating as that tells you the fiber thickness of the nylon. The higher the number is the thicker the fiber (stronger, but bit heavier). For larger and much used luggage, you should be looking for something in the 500 - 2,000 denier range. There is also available extensive range of hard-sided spinners, usually made from polycarbonate, ABS, polypropylene or aluminum. Polycarbonate is the same material as used in the making of bulletproof glass. It is both durable and flexible so that when under stress, it flexes to absorb the impact and then flexes back afterwards to its original shape. The main benefit of spinner travel luggage is how easy it is to maneuver them in all directions. This makes them great in tight and narrow spaces, like airline aisles or escalator. Samsonite is one of the best-known luggage brands worldwide, globally recognized for its stylish quality travel bags and accessories. The Samsonite spinner luggage is increasingly popular choice. Read our Assessment on Samsonite Luggage. Being able to push, pull and turn the spinner also reduces the efforts and strain on the arms and back. For many travelers this has made all the difference when travelling, especially for elderly or people with reduced mobility. The main disadvantage is that you have to take care when on a sloping surface, otherwise your spinner can easily roll away from you. So if you find yourself in a street in San Francisco, make sure you hold on to your spinner. Another disadvantage is that the luggage wheels are unprotected and therefore there is more risk of them falling off or damaging in transit. This is likely to be the reason why spinners are more popular as carryon luggage and laptop cases, but not as common choice for check in suitcases. The increased popularity of spinner luggage indicates that the pros seem to outweigh the cons for most travelers, especially as carryon luggage. Spinner travel luggage comes in all sizes and price ranges so everyone should be able to find something to fit his or her travel needs and taste. Spinner carryon luggage is very popular choice due to its' easy maneuverability. Walking with your luggage through airport terminals or subways, can be very strenuous but a spinner carryon is great. The spinner laptop is great for business trips or for anyone travelling with their laptop with them. Both of these carryon types are available in wide range of colors and sizes. The ultimate spinner travel luggage fan can get spinner luggage set with 3 or 5 luggage pieces, and in both soft or hard-sided. Buying your luggage online has some benefits above buying them in a retail outlet. You have greater range of luggage to choose between. You can read luggage reviews from other shoppers who have bought the same luggage. Most online retailers will offer free shipping and returns if you buy for a certain amount, i.e. so you can return the luggage if it does not meet your expectations. Always read the customers' luggage reviews before you buy your luggage, as they can be very helpful.